CALX Premium Quality Conventional Antifreeze and Coolant is a heavy-duty formula suitable for both car and truck engines. It has an advanced complex of multi-functional inhibitors with dispersants to reduce scale and improve heat transfer and multi-metal corrosion inhibitors to protect all cooling system components and help costly engine failure. It provides protection from freezing, overheating, rust and corrosion and is fully compatible with all major brands of premium, conventional antifreeze/coolants. 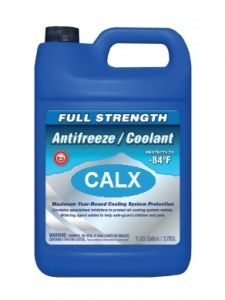 CALX Premium Quality Antifreeze is formulated both as a Ready-To-Use, 50-50 premixed and a Full Strength Concentrated Antifreeze, which can be diluted for individual freeze and boil-over protection.